Ten teachers from the Science for Life (SfL) partnership schools gathered at Gillespie Primary School on November 22nd, for the first of our SfL science CPD days. Over the course of the day they developed their science subject knowledge, pedagogy and confidence within the context of forces - and they had a great deal of fun! Most of the attendees were Y3 and Y5 teachers, and some were science leads. 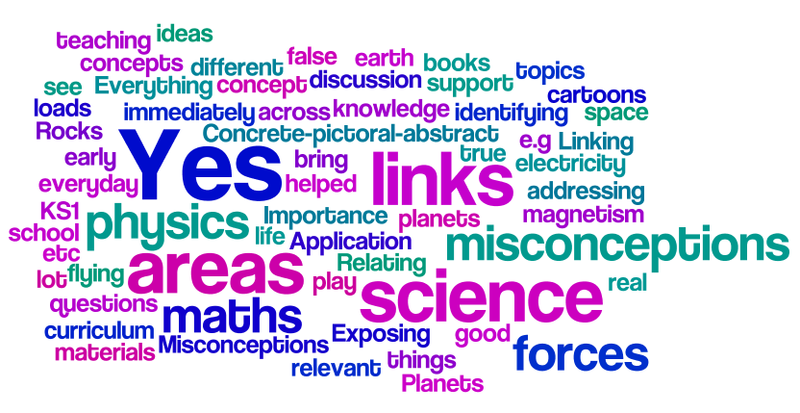 As well as a subject knowledge focus on forces, there was a pedagogical focus on misconceptions - with the intention that knowledge of how to identify and address misconceptions will be transferred to teaching other topics. Teachers also spent some time exploring links to other curriculum areas, both within science and also with other subjects, in particular mathematics. Throughout the morning, teachers experienced for themselves how difficult it can be to address misconceptions by coming to terms with one that they all held themselves! Our everyday experience tells us that moving objects naturally slow down and come to a standstill, unless a force is applied to keep them moving. However this is not a universal law - it is a special condition due to the effects of gravity and frictional forces on Earth, which are tricky to get away from. This is a prime example of a commonly held and deep-rooted misconception, which is very difficult to resolve. Through a combination of thought experiments (one of which involved a magical physics fairy, capable of slowing down and stopping time…), relatable every-day experiments, and examples of objects in space (which is not subject to the same forces as down here on Earth), teachers began to change their thinking. Teachers also tried out a number of strategies for finding out pupils’ misconceptions, and were signposted to resources that they can use for developing their own subject knowledge and pedagogy. All the SfL schools whose teachers attended the CPD day will receive a set of resources to support the teaching of forces. This includes a mixture of class sets and demonstration resources, and also include enrichment materials. Teachers had some time to try out these resources during the day, so that they can confidently put them into practice when they arrive in school. This is the first of four CPD days that will be held for SfL schools this year, which will cover all physics topics of the science curriculum. Subject to continued funding, the intention is to cover all the chemistry topics next year and biology the year after that, so that schools receive CPD and resources to support teaching of the entire science curriculum over the course of three years. What are the top three things you will take away from today's CPD? Is there anything from today's CPD that is relevant to teaching other science topics? Is there anything from today's CPD that is relevant to your colleagues? If so, how will you share it with them? Did today's CPD meet your expectations? Do you have any further feedback about today's CPD?